SnowPrint is a 3D Studio Max plugin that enables you to let objects print on other objects. Leave footprints in snow, sand or mud. Build wet- and collision-maps. Bring details to your winter sceneries! SnowPrint supports nearly everything having faces in the viewport! Just use the SnowPrint installer. You find the SnowPrint-Texture in the material editor. You can download the SnowPrint 2.0 tutorial scene (3D Studio Max 2010) here. This is where you pick the objects that should print on the surface/texture. The first button enables you to pick a single object. The second button adds the current selection to the list. The third button deletes a selection from the list of printing objects. The surface to print on is automatically selected for you, it's the one you put the texture on. Just put the SnowPrint texture in a map slot of the object's material. This setting controls the details of the resulting textures. You should use less quality only for previews or if you need very blurry imprints. The maximum depth controls the amount of white that is put on the texture. Take a look at your animation and find the longest distance between the surface and the printing objects below for best results. If your surface has thickness you can select "use surface height". Here you tell SnowPrint which image size your texture should have. Use "keep aspect ratio" (chain symbol) to link width and height together. The "auto tune" button on the most right makes a suggestion for a best fitting texture size regarding your surface object. 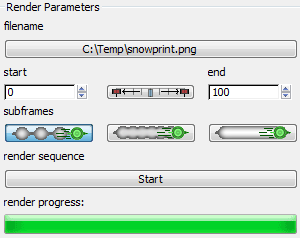 These parameters control the renderings made by SnowPrint. First you have to pick a folder, a filename and the extension (*.png, *.jpg, *.bmp, *.tif, *.tga). SnowPrint automatically adds the frame number to the filename and the name of the surface (this is necessary because you can put the same SnowPrint texture on multiple objects, although we do not recommend that). Next you have to pick the start and the end frame or select "full animation range" to render the whole timeline. If you have fast moving objects and recognize less precise imprints on your SnowPrint texture, you can set a better subframe sampling: 1/1, 1/2, 1/4. All you need to do at the end of the configuration process is to hit START and wait for SnowPrint to finish its calculations!